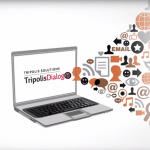 Home » Portfolios » How to send SMS messages with Tripolis Dialogue? The SMS Module of Tripolis Dialogue allows you to send personalized messages via SMS, where contact details can easily be imported from the contact database. In this video we will show you how to create, personalize and send SMS messages within Tripolis Dialogue.